I really dislike conflict, but sometimes it cannot be avoided. So when I saw this book in my local library, I thought it might be worth a read. The book promotes the idea that, if you know how to deal with conflict well, you can turn it into your biggest opportunity for success. 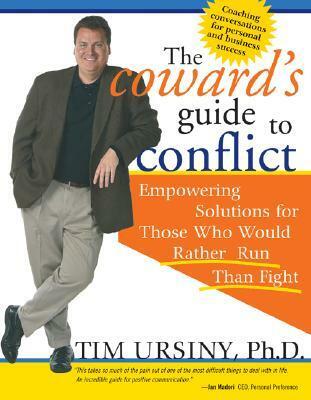 The Coward’s Guide to Conflict by Tim Ursiny, PhD, offers the reader the tools they may need to manage conflict successfully. It covers topics including why you must know how to handle conflict and, perhaps more importantly, how to recognize conflict before it happens. Dr. Tim Ursiny is the founder of Advantage Coaching & Training. He trains and coaches peoples and groups in areas including stress management, conflict resolution, dealing with change and building customer loyalty. He is an American author of several books including “The Confidence Plan,” “Tough Times Tactics” and “The Top Performer’s Guide to Attitude.” I liked this book so much and found it so useful that I am seriously considering buying myself a copy so that I can work through it and do all the exercises in my own time. The Coward’s Guide to Conflict is nicely written in an accessible style. Dr Ursiny offers good examples of the theories he talks about. I would thoroughly recommend this book to anyone who has difficulty dealing with conflict and wishes they could do so more constructively.